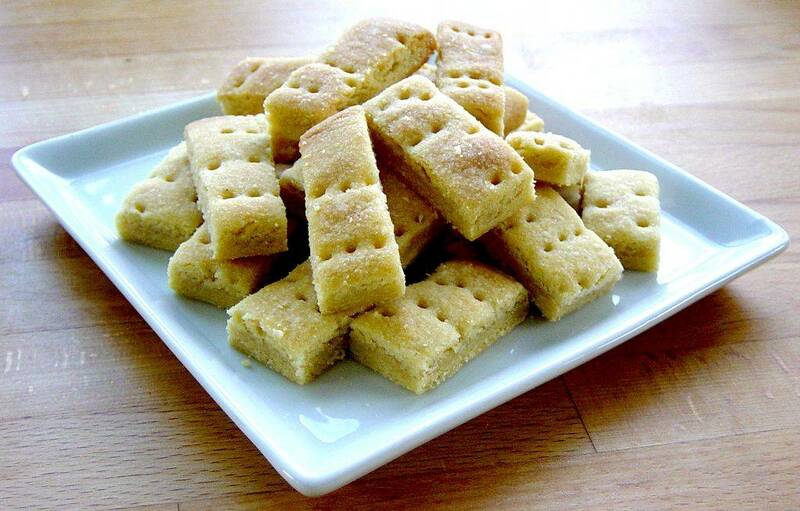 Shortbread is a funny cookie. It is literally the most simple cake recipe there is! Only 3 ingredients. I do not think you can make a recipe more simple than that and then get something edible out of it, that can be called a cake. For me, this is the "Ground Zero" of the cakes. Where it all starts. All other cakes are variations of it. Well ok. That is perhaps not the entirely right, but it only takes 5 minutes to bake, and can be eaten with jam or other sweet spreads. Start with butter and sugar. Mix all ingredients together. Gather the dough into a solid lump and roll out to a thickness of approx. 1 cm (½ inch). Shape the cookies. I usually use a pizza cutter to cut it into oblong squares, but it is also an excellent time to use the cookie molds you have lying somewhere at the back of the closet. Sprinkle them with a little extra icing sugar.